Articles in the Press « Stop the Untouchables. Justice for Sergei Magnitsky. 9)	The Hon. Irwin Cotler, former Attorney General and Justice Minister of Canada (Outstanding Contribution to Global Magnitsky Campaign), author of the Magnitsky bill in the Canadian Parliament, and chair of the Justice for Sergei Magnitsky Inter-Parliamentary Group. 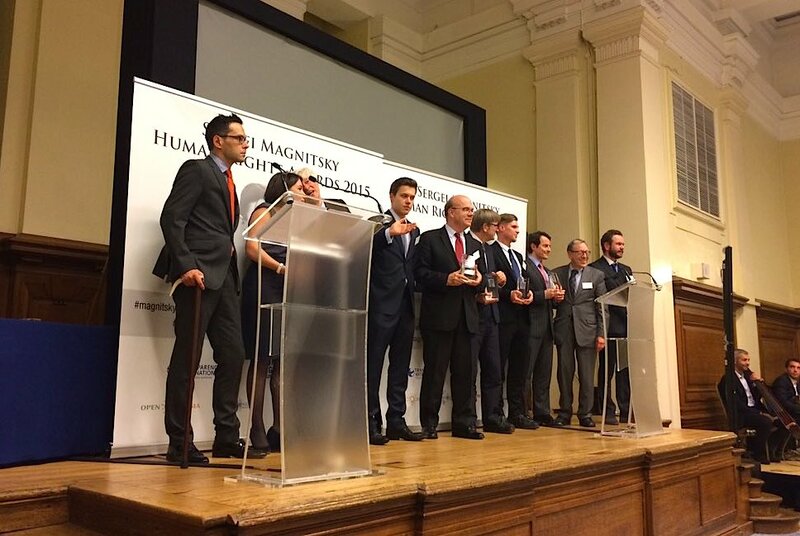 The organising committee of the Global Sergei Magnitsky Human Rights Awards this year consists of activists from major international organizations, including Transparency International, The Henry Jackson Society, Fair Trials International, the Central and Eastern European Council of Canada, and the British Parliament’s All-Party Group on Anti-Corruption. 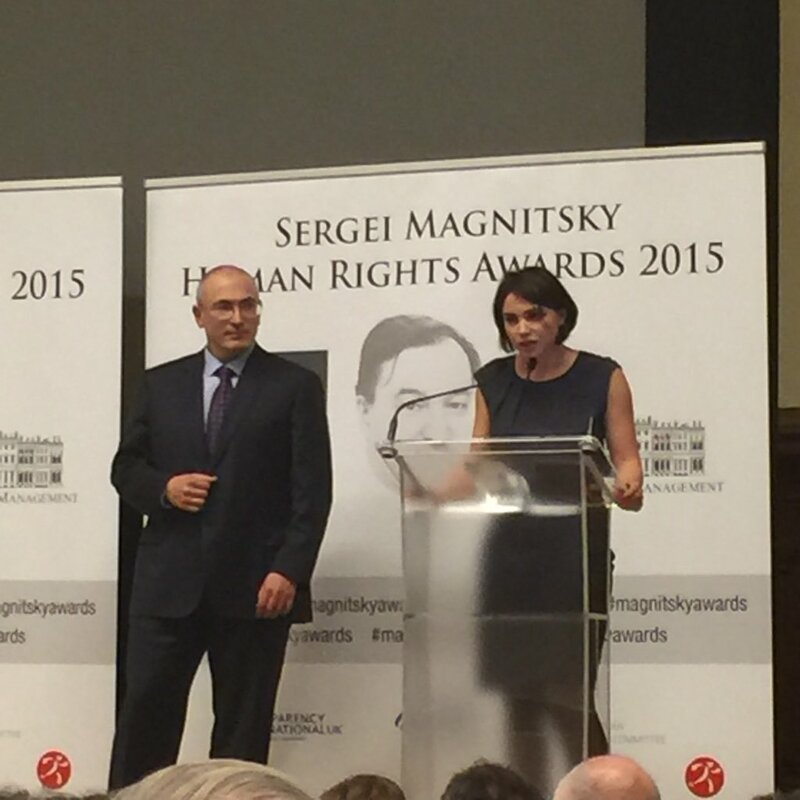 The Sergei Magnitsky Human Rights Awards, a newly-launched international human rights prize, are advanced by the Magnitsky family as a “beacon of support” for all those who fight injustice around the world and promoted by the Justice for Magnitsky Campaign. Sergei Magnitsky, a Russian lawyer, uncovered the largest publicly-known corruption case in Russia involving the theft of $230 million, and testified about it naming complicit officials. He was arrested by some of the implicated officials, held for 358 days in pre-trial detention in torturous conditions, and killed in Russian police custody on 16 November 2009. Senator Rubio has called to intensify U.S. sanctions on those responsible for the murder of Sergei Magnitsky and the assassination of Boris Nemtsov. Senator shared his thoughts and prayers with the family and colleagues of Sergei Magnitsky who was killed six years ago at the age of 37 in Russian police custody after exposing the largest publicly known tax refund corruption case in Russian history. Senator Rubio also called on the Senate to pass the Global Magnitsky bill to stand up to corruption and human rights abuses. “Today marks the 6th anniversary of Sergei Magnitsky’s murder at the hands of Russian officials. Sergei was detained and tortured for over a year after exposing Russian government corruption. The anniversary of his brutal murder reminds us that governments will go to great lengths to hide their corrupt practices, even take an innocent man’s life. Unfortunately, the Russian officials who are responsible for Sergei’s murder remain at-large. The U.S. should intensify efforts to implement the Sergei Magnitsky Rule of Law Accountability Act of 2012 to bring to justice the individuals responsible for Sergei’s death as well as other Russian human rights violators, such as those involved in the brutal assassination earlier this year of Russian opposition figure Boris Nemtsov. In honor of Sergei’s memory, the Senate should pass the Global Magnitsky Human Rights Accountability Act which would impose financial and visa sanctions on individuals responsible to human rights abuses and corrupt government officials around the world. The United States should not allow these criminals access to our country or financial institutions. Boris Nemtsov, the Russian politician, assassinated near the Kremlin in late February this year, was posthumously awarded the Sergei Magnitsky 2015 Human Rights Prize for Democracy. The prize was received by his daughter Zhanna. Winner of 2015 Sergei Magnitsky Award for Campaigning for Democracy: (Posthumously) Boris Nemtsov. Boris Nemtsov, the Russian opposition leader, winner of the Sergei Magnitsky’s Campaigning for Democracy Award, was a friend of the Justice for Sergei Magnitsky campaign. Boris was one of the strongest voices advocating for the U.S. Magnitsky Act and the implementation of Magnitsky sanctions in Europe, calling them “the most powerful instrument of pressure on killers and cleptocrats.” (see at 27 min of Youtube video of Nemtsov’s interview. On 27 February 2015, just two days before he was planning to lead on 1 March 2015 the “March Spring,” a large anti-Putin demonstration in Moscow to protest against the Russian war against Ukraine, and three hours after his live appearance at an independent radio station calling for his supporters to join him, Boris Nemtsov was assassinated next to the Kremlin. In his last live interview, Boris Nemtsov stated his belief that a large showing of people at the demonstration he was planning to lead, could bring a political change in Russia. He said: “If many people come to demonstrate, this will bring change. This march could be a turnaround point. It could make Kremlin sober. And gradually we will be able to achieve a change in the political course.” (see at 44 min. Youtube video). The Sergei Magnitsky’s Award for Campaigning for Democracy was received by Nemtsov’s daughter, Zhanna, and presented by Mikhail Khodorkovsky, one of the longest serving political prisoners in modern Russia. Six years ago, on November 16, 2009, Russian lawyer Sergey Magnitskiy died in a Moscow prison. An investigation by Russia’s Presidential Human Rights Council found that Magnitskiy had been severely beaten in prison and members of the Council said his death resulted from the beatings and “torture” by police officials. Sergey Magnitskiy was arrested after uncovering corruption by Russian officials, spent a year in pre-trial detention before his death, and was posthumously convicted for the crimes he himself uncovered. The anniversary of Sergey Magnitskiy’s death is a reminder of the human cost of injustice. Those responsible for his unjust imprisonment and wrongful death remain free, despite widely-publicized and credible evidence of their guilt. We salute Sergey Magnitskiy’s memory and those who work to uncover corruption and promote human rights in Russia despite official intimidation and harassment. In honor of Sergey Magnitskiy, we will continue to fully support the efforts of those who seek to bring these individuals to justice, including through implementation of the Sergei Magnitskiy Rule of Law Accountability Act of 2012. U.S. Senator Ben Cardin (D-MD), Ranking Member of the Senate Foreign Relations Committee and author of the Sergei Magnitsky Rule of Law Accountability Act (Public Law 112-208), issued a statement ahead of the sixth anniversary of Sergei Magnitsky’s murder. “November 16th marks the sixth anniversary of the brutal death of Sergei Magnitsky, the courageous voice against Russian corruption who was imprisoned and tortured in a Russian prison for 358 days before his death. On this anniversary, we must remember the principles of truth, justice, and the rule of law that drove Sergei, a 37-year-old tax lawyer, husband and father working for an American firm in Moscow, to expose the largest known tax fraud in Russian history. Senator Cardin is the author of the Global Magnitsky Human Rights Accountability Act, a bill that would ensure human rights abusers and corrupt officials worldwide are denied entry into the United States and barred from using our financial institutions. The bill was approved by the Senate Foreign Relations Committee in July. The legislation would expand the Russia-specific sanctions in the Sergei Magnitsky Rule of Law Accountability Act (Public Law 112-208) and apply it globally. Accordingly, Tuesday, I introduced a private member’s bill that would explicitly authorize the Canadian government to impose visa bans and asset freezes on human-rights violators. Although my bill is unlikely to be adopted before the House rises, I offer it as a template for how the motion passed by the House and the Senate could be enacted in law. There is still time for the government to either take over my bill or to introduce similar legislation of its own, out of respect for the unanimous will of Canadian MPs, and out of solidarity with the victims of human-rights violations in Russia and around the world. MP Irwin Cotler today introduced the Global Magnitsky Human Rights Accountability Act (C-689), which would allow for the imposition of travel bans and asset freezes against human rights violators. In March, the House of Commons unanimously endorsed a motion by Cotler calling for such sanctions, and a similar motion introduced by Sen. Raynell Andreychuk passed the Senate in May, but the government has yet to heed Parliament’s call. Magnitsky laws are named for Russian lawyer Sergei Magnitsky, who blew the whistle on large-scale tax fraud committed by Russian officials before being detained, tortured, and killed in prison in 2009. He was posthumously convicted, in a Kafkaesque cover-up, of the very corruption he had exposed. Resolutions calling for Magnitsky sanctions have been passed by the European Parliament, the Parliamentary Assembly of the Organization for Security and Cooperation in Europe, the Parliamentary Assembly of the Council of Europe, and legislatures in the United Kingdom, the Netherlands, Italy, the United States, and Canada. When the Canadian motion passed the House, MPs and Senators from all parties – including the Parliamentary Secretary to the Minister of Foreign Affairs, David Anderson – held a joint press conference to mark the occasion. Thus far, however, only the U.S. has moved from words to deeds. Investor Bill Browder pulls back the curtain on Putin’s culture of corruption. The description is accurate as far as it goes. Browder’s lawyer, Sergei Magnitsky, uncovered a $230 million fraud perpetrated by Russian government officials against one of Browder’s companies in 2008. He was jailed after disclosing the fraud and subsequently killed while in prison. Browder, who as founder and CEO of Hermitage Capital Management had made and lost billions of dollars in Russia, has devoted himself since Magnitsky’s death to exposing corruption and human rights abuses in Russia. For his efforts, Browder now finds himself subject to extradition to Russia, where the government has convicted him in absentia of tax evasion and sentenced him to nine years in prison. But that’s only part of the story. The first half of Red Notice traces Browder’s improbable journey from prep-school washout through college, business school, and a series of consulting and Wall Street jobs before becoming Russia’s largest foreign investor. The son of left-leaning academics and grandson of Earl Browder—the labor organizer and head of the American Communist Party—Bill Browder rebelled by becoming a capitalist. He recounts his early training through a series of pitch-perfect descriptions of J.P. Morgan recruiters, Boston Consulting Group managers, Salomon traders, and dealmakers such as Robert Maxwell, Ron Burkle, and Edmond Safra. Whether consulting for a Polish bus company, advising a Murmansk fishing fleet, or finding undervalued, newly privatized companies in Russia, Browder encounters real-life opportunities and absurdities that read better than fiction.